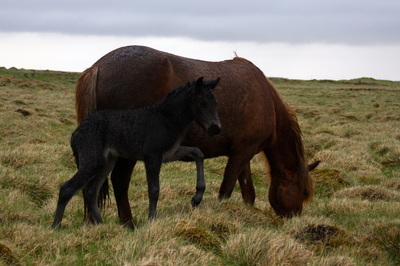 Pictures of some of our pregnant mares below.. Most of our mares are now home at Eyland, pregnant and happy. 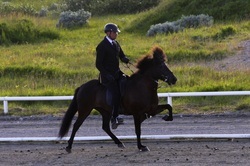 One of the stallions that we used this summer is Ölnir from Akranes after Glotti from Sveinatunga and Örk from Akranes. 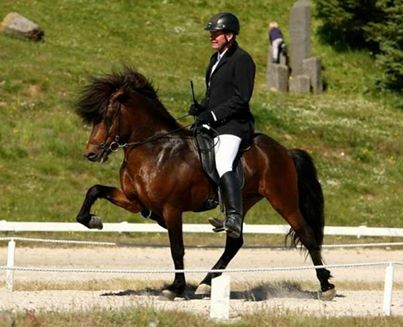 Ölnir is a interesting stallion with a royal bloodline, he was the highest judge in 5 years old stallion on LM2014 with total of 8.71. 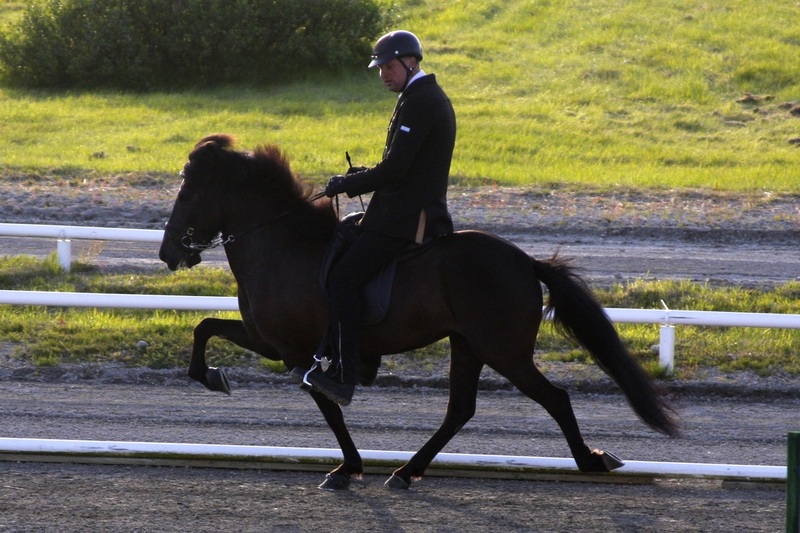 We have confirmed pregnancy in two of our mares - Askja from Mykjunesi (8.32) and Hnáta from Hábæ (8.18), very different mares.. Askja a top fivegater with 9 for tölt, slow tölt and 9.5 for pace and willingness. Hnáta a top fourgater with 9 for tölt, gallop, spirit, form, slow tempo tölt and chanter but 9.5 for trot. 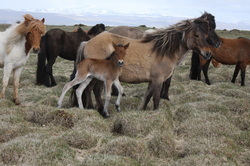 So we are looking forward to our foals after them next year :) Karen from Árbær (8.10) was also brought to Ölnir and is waiting to be ultra sounded. 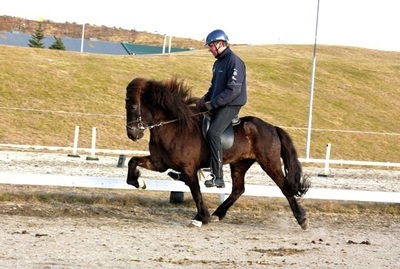 We are proud breeders and owners of our Askja from Mykjunesi - IS2008286725. 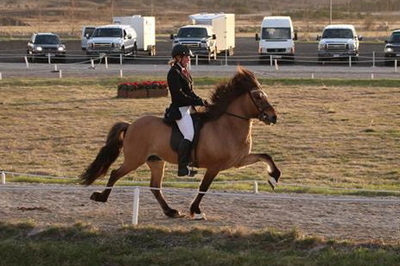 You can truly say that she is a special mare in our eyes. 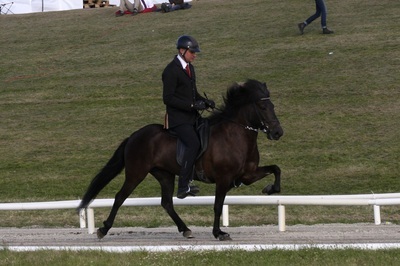 At Landsmót in Hella 2014 she score 8.72 for riding abilities - 9.5 for spirit, 9 for tölt, slow tempo tölt and pace. This spring she also got 9.5 for pace. Amazing individual with perfect spirit, good and clear gates as well much movements and charisma. This winter she was trained by Davíð and showed by his brother Siggi Matt. 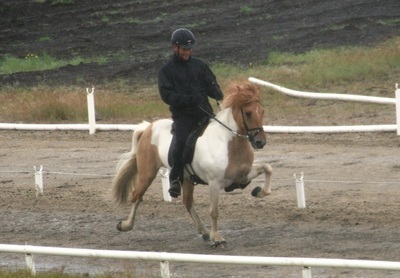 Askja showed it right away as a youngster what she was capable of. 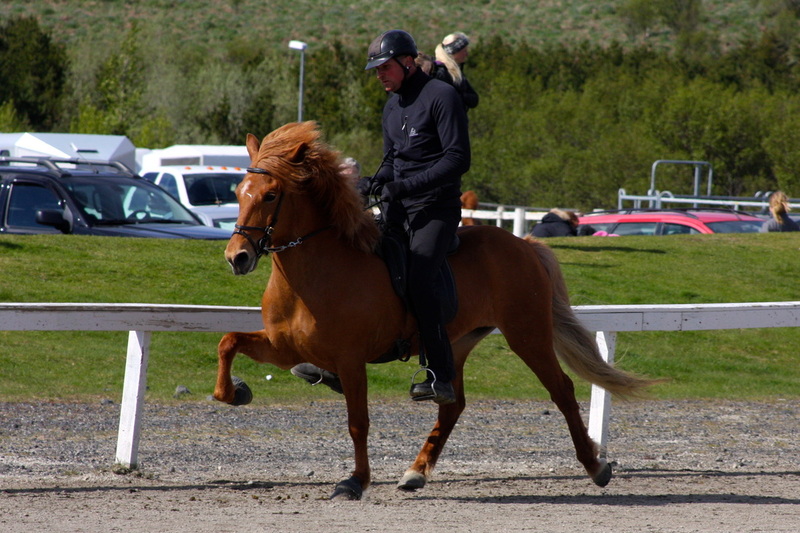 Bylgja Gauksdóttir trained her the first two years and did a fantastic job like she always does. 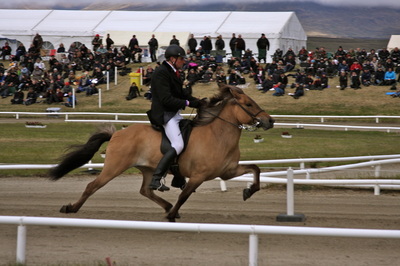 They qualified at LM2012 in Reykjavík and participated in 4 years old class of mares. The Askja got 9 for pace, 8.5 for tölt and more trades. She reached good 1.price only 4 years old. Now there is time to put Askja into breeding but this is bitter sweet as she is such a fantastic horse to train and be around in the stable. 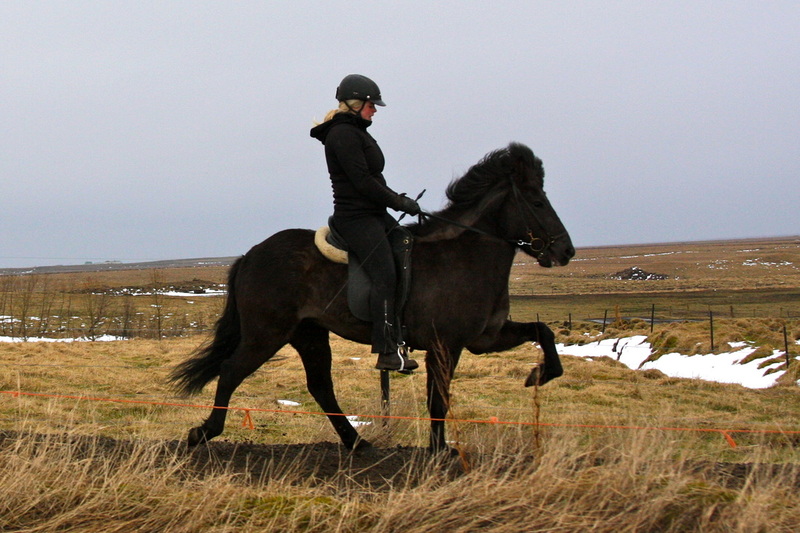 Davíð has often come home this year with a big big smile after riding our black queen. 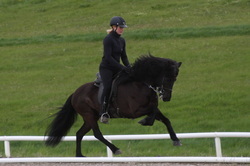 :) As well as she could be a good FIPO sport horse for F1, pace test, speed pace and so on. But we can´t wait to get an offspring of our Askja but she is pregnant with Ölnir from Akranes the winner of 5 years old stallions at LM2014. Exciting times ahead with our favourite Askja! Vaka from Árbæ had a beautiful son of Kjerúlf from Kollaleira. 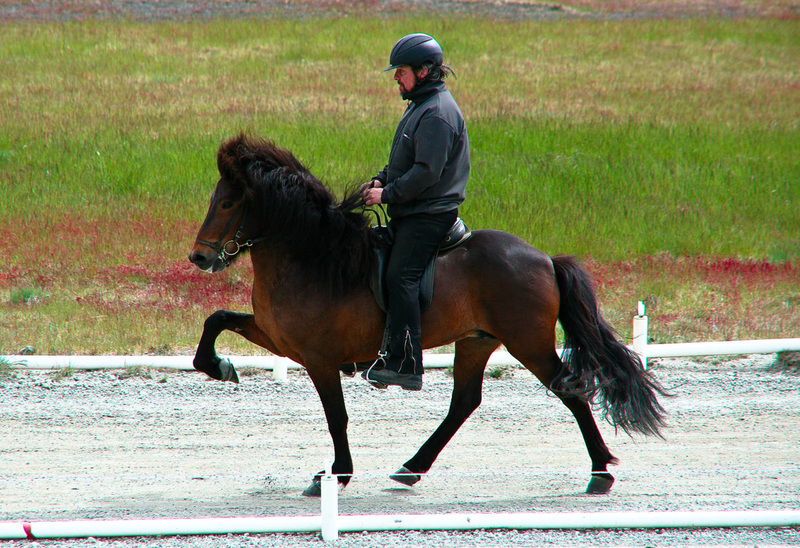 He is bay with great posture and movements. We are truly excited for this little guy! His bloodline is really good and his BLUP 120. 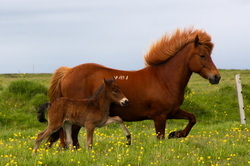 He is now with his mother meeting up with Stáli from Kjarr. We have shown three mares this spring and all have qualified for breeding show at Landsmót. These are Askja (8.30), Gyðja (8.23) and the fourgater Von (8.04). 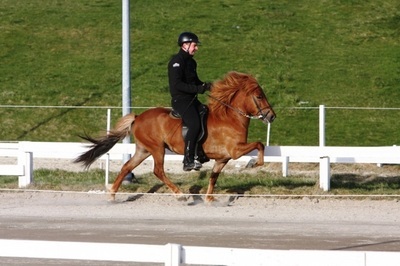 Askja from Mykjunes is owned and breed by us. She is after our Elja from Þineyrar and Akkur from Brautarholt. She got 1.price only 4 years old on LM2012 - a highly talented mare that now raised her riding abilities to 8.68 with 2x9.5 - and in total 8.30. 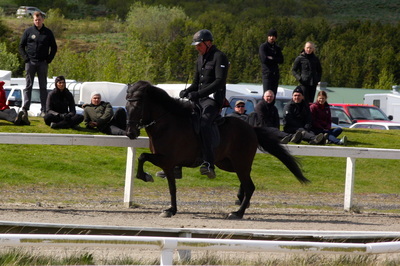 Trained by Davíð Matt and showed by his brother Siggi Matt. She is one of the absolute best mares we have gotten to know. She will participate on Landsmót but then she will go in foals. She is now standing by Ölnir from Akranes (8.67). 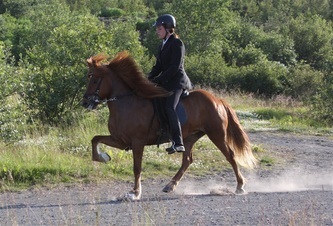 The second one is Von from Ey I owned by us but breed by Gunnar Karlson at Ey I. 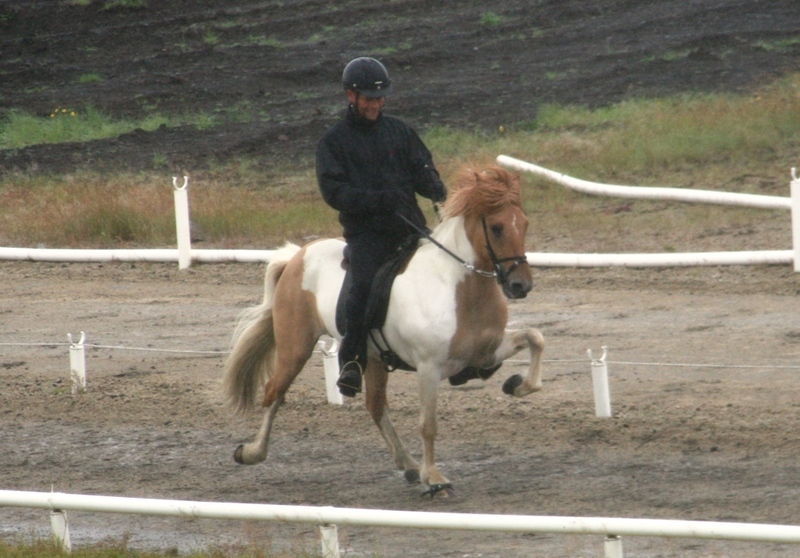 She is after Fjarki from Breiðholt and Andvari daughter Venus from Ey I. 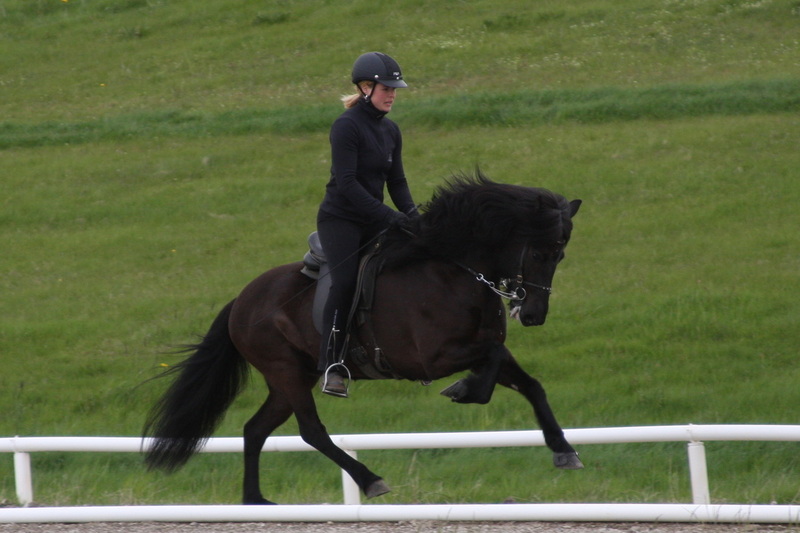 She has always been a queen in the field.. black with high and wide movements. 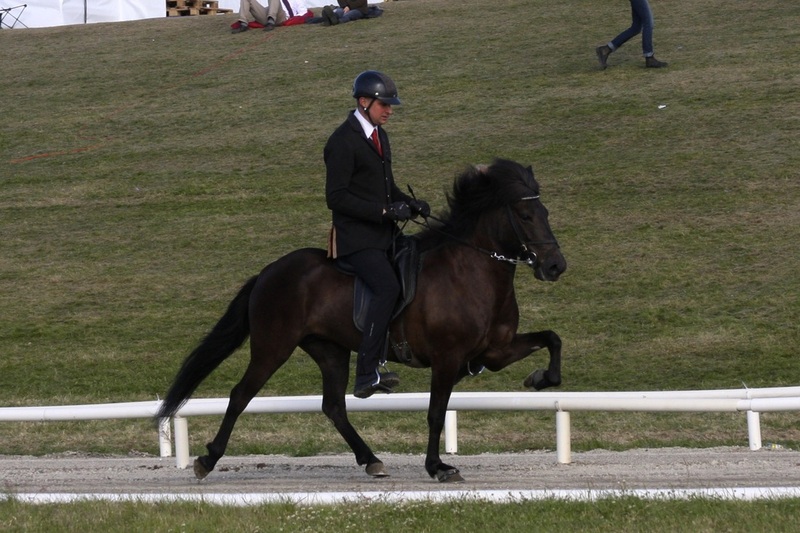 She got 8.01 for confirmation and 8.05 riding abilities - 9.5 for gallop and 9 for spirit, form under rider, slow tempo tölt and chanter. 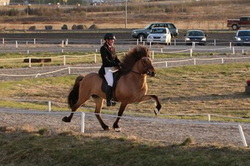 Trained and showed by Bylgja Gauksdóttir. 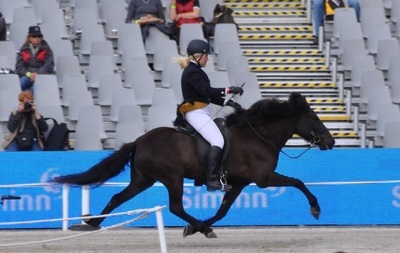 She has the material to become a top sport competition horse in T1 and V1. 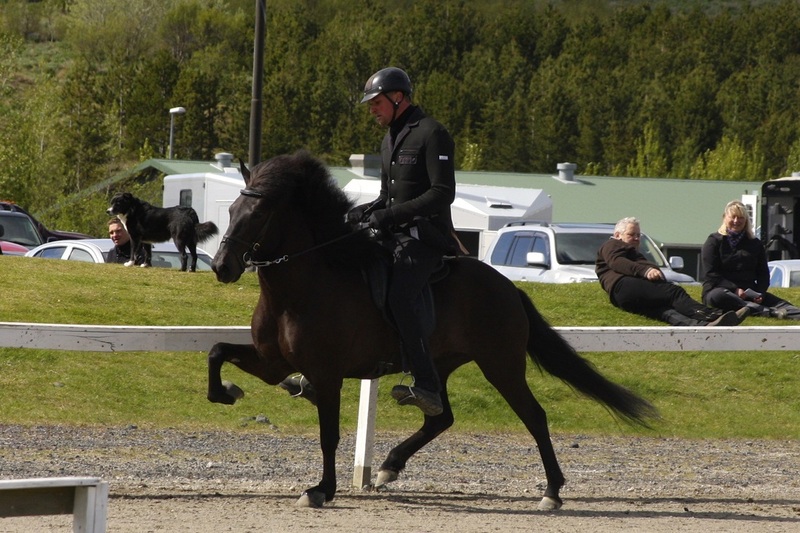 The third one is Gyðja from Árbær, breed by Gunnar Jóhannson and owned by Gunter Jönhk at Störtal. 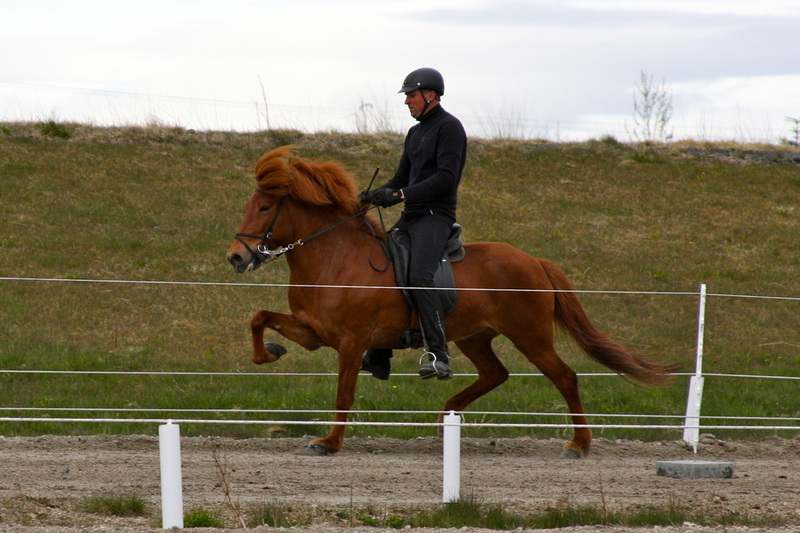 We sold him Gyðja as a two years old youngster and have taken care of her ever since like she is our own - she kind is ;) She is after Álfur from Selfoss and Glás from Votmúla a daughter of Baldur from Bakka. 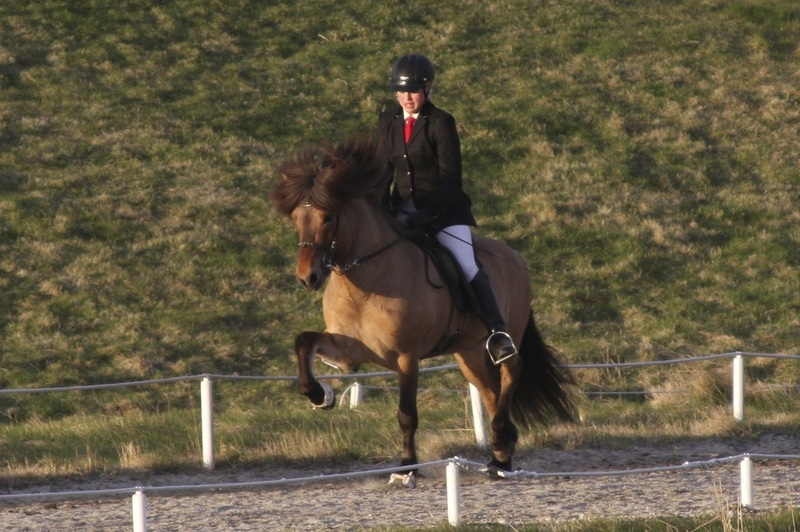 She got 8.05 for confirmation and 8.35 in riding abilities, a even mare with 6x8.5. 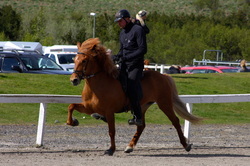 She has been trained by Davíð Matt but showed by his brother Siggi Matt. 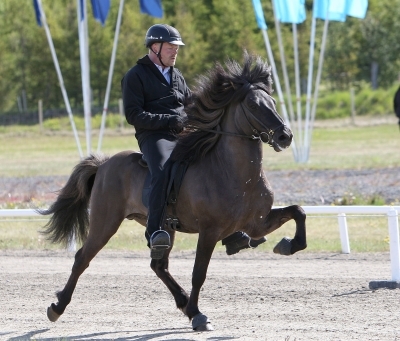 She will participate on Landsmót and the go in foals. She is now standing by Stáli from Kjarr. 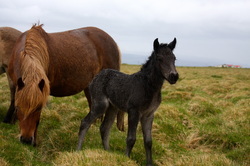 More marefoals - two PRINCESSES! Now there are six foals born at Eyland and all of them fillies! 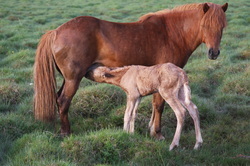 That has never happened and on the other hand we have always gotten more stallion foals so this is a nice change! The next two mares with introduce are palomino beauty after Viðja from Meiri-Tunga III (8.21) and Andri from Vatnsleysa! She is a dream foal, she looks great and has this rare colour! The second one is a red dun mare after Spes from Stóra-Hof (8.03) and Stáli from Kjarri! She looks really amazing and has a cute colour! 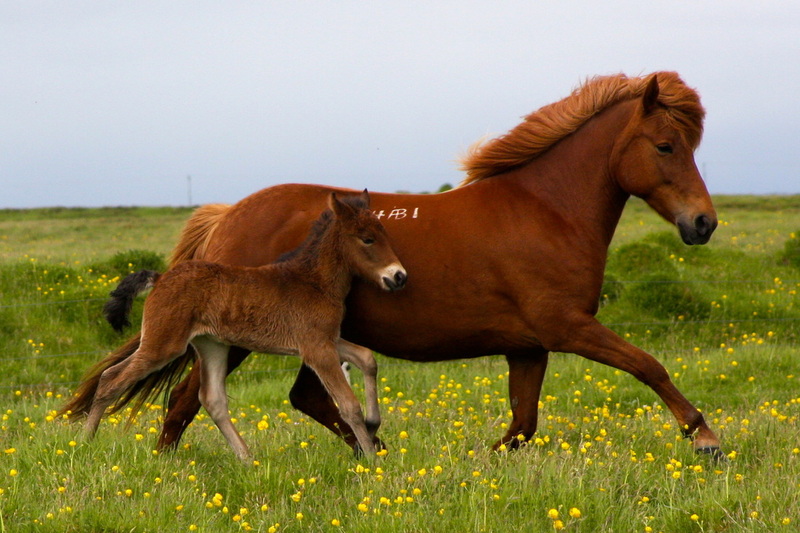 She is now by her mother by Konsert from Hof. This is the most exciting time of year by us like other breeders. 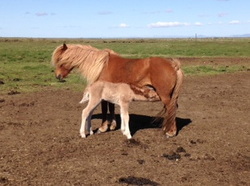 The first foal this year was a bay filly after Hátíð from Fellskot (8.05) and Framherji from Flagbjarnarholti (8.27). 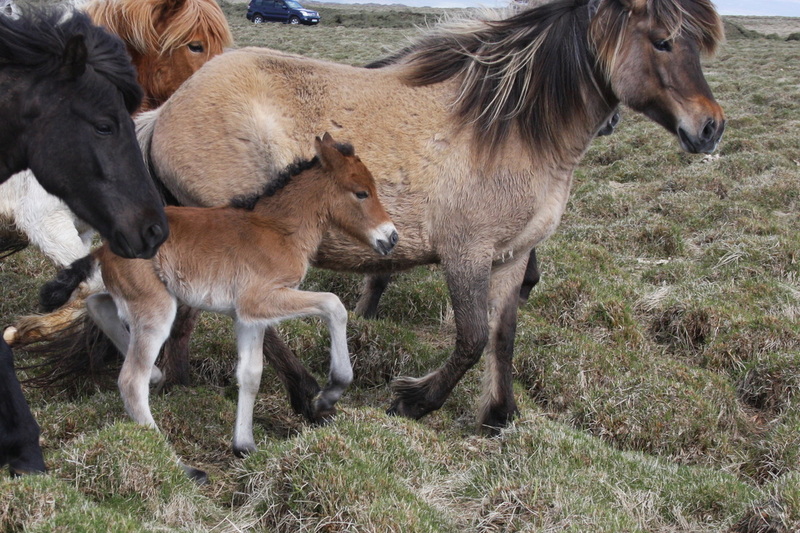 A very exciting bloodline behind this little one but Hátíð is a Aronsdaughter and has the same mother as Hnokki from Fellskot. 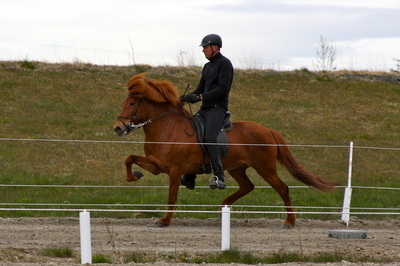 Dagfari from Eyland is a young stallion, turning six this spring. 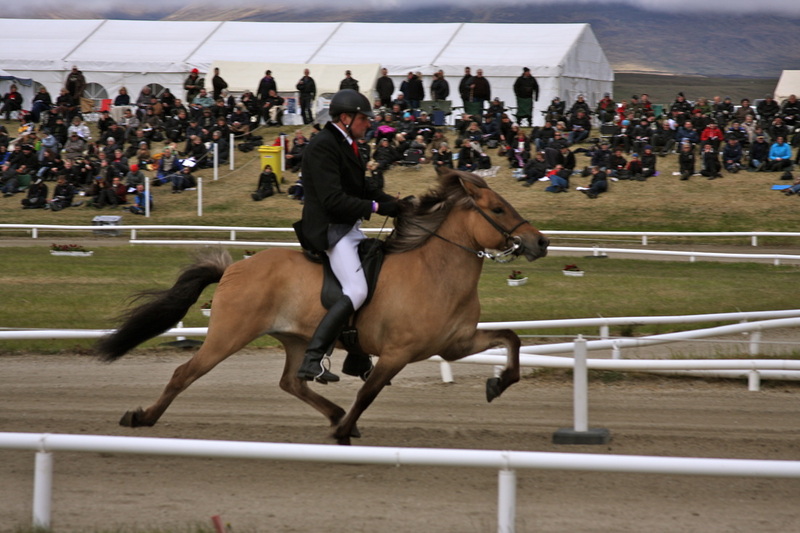 He is after Aron from Strandarhöfði and our Vera from Ingólfshvoli. 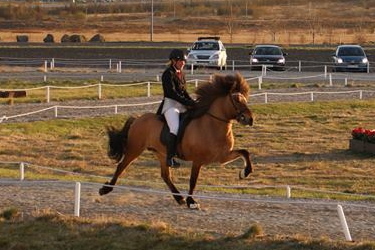 He was started last weekend on Reykjavíkurmeistaramót by his trainer Bylgja Gauksdóttir. They did a splendid job at their first big tournament together - B finals in tölt and just outside them in V1. In the B-final they came second scoring eg. 7.5 for slow tempo tölt. It will be fun to watch them on the upcoming season.